An epic SpaceX Falcon Heavy launch – only the second trip to space for this rocket line – brings a set of NASA technology one step closer to getting its own ride into orbit. 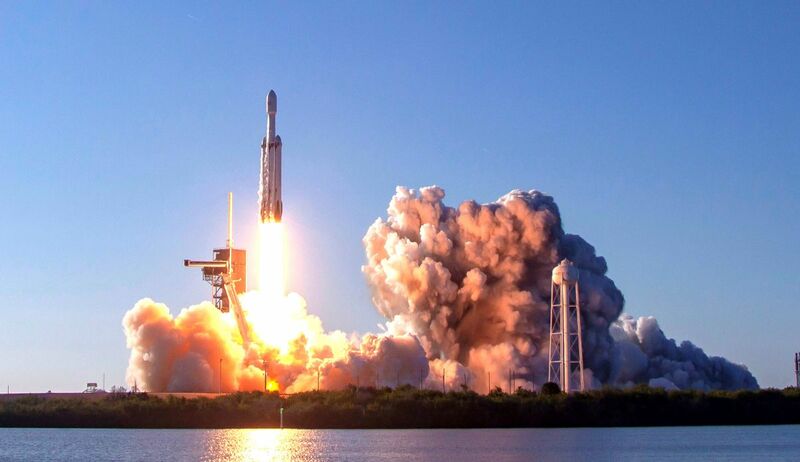 Falcon Heavy made its first operational flight yesterday (April 11), sending communications satellite Arabsat-6A aloft while successfully landing all three of its rockets – including the core and two boosters. "We are pleased with the success of yesterday's Falcon Heavy launch and first-stage landings," Jim Reuter, NASA's acting associate administrator for its space technology mission directorate, said in a statement . The 27 engines of SpaceX's Falcon Heavy rocket's first stage, nine per booster, launch the massive rocket off Launch Pad 39A and NASA's Kennedy Space Center in Florida on April 11, 2019. Half of the payload fairing that protected the Arabsat- 6A satellite during the second-ever launch of SpaceX's Falcon Heavy rocket sits on a recovery ship on April 11, 2019. NASA is planning to launch several experiments into space simultaneously, all of which aim to improve the design and performance of future spacecraft. The missions will blast off from the Kennedy Space Center in Florida as part of the U.S. Air Force's Space Test Program-2 (STP-2) mission. The current targeted launch date is sometime in June according to Spaceflight Now; in the same statement, NASA said the Air Force and SpaceX will prepare for the launch in the next few months. One of the NASA experiments involves a pair of cubesats, small and relatively cheap satellites about the size of a breadbox . These devices together comprise the Enhanced Tandem Beacon Experiment (E-TBEx) and will measure how "bubbles" (or distortions) in the upper atmosphere interfere with radio signals and GPS. The agency hopes to better forecast these disturbances to improve future communications technologies. The Falcon Heavy will also loft NASA's Green Propellant Infusion Mission, which will test an alternative to the traditional chemical propulsion used in rockets. It will test a new fuel / oxidizer blend called hydroxyl ammonium nitrate, which, according to NASA is safer to handle and better for the environment than hydrazine, a popular but toxic rocket engine fuel . Rounding out NASA's planned cargo for the mission is the Deep Space Atomic Clock, which is a highly accurate timepiece that is expected to improve navigation, and the Space Environment Testbeds device, which examines how solar radiation near the Earth affects hardware on the spacecraft. The nonprofit Planetary Society has also arranged to fly a payload on the STP-2 Falcon Heavy launch. That device, called LightSail will test whether a cubesat can navigate into Earth orbit using a 344-square foot (32-square meter) solar-powered sail. Follow Elizabeth Howell on Twitter @howellspace . Follow us on Twitter @Spacedotcom and on Facebook .